If you enjoy this "Under the Sea" character dining experience you'll be thrilled to know that dinner has now been added as a character meal as well. 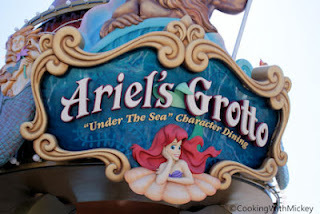 Beginning June 15, 2012, Ariel will host breakfast, lunch and dinner. Reservations can be made by emailing your reservation request to dine@disneyland.com or calling the Disney Dine Line at (714) 781-DINE. As of June 14, 2012 the World of Color dining package will no longer be offered at Ariel's Grotto. There is no word yet on if another dining location will be added to replace it. However, Wine Country Trattoria will continue to offer the World of Color dining package. Wine Country Trattoria World of Color dining package includes a selection of items from the menu for lunch. For dinner a 3-course meal consisting of a starter, entree and dessert. Lunch and dinner include tickets to either the first or second showing of World of Color.